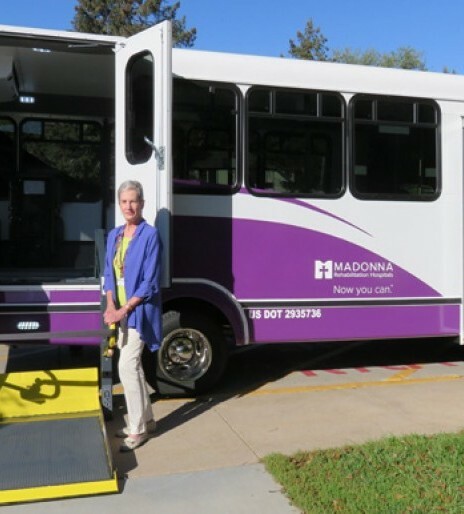 Patrick Shemek (left), Madonna transportation manager, demonstrates the wheelchair lift on the new van Kris Peterson (right) donated to Madonna. Donors and volunteers can be one in the same. A case in point – when a dedicated volunteer donates a brand new wheelchair-accessible van that comfortably transports residents of Madonna’s St. Jane de Chantal extended care services to their medical appointments and outings. Kris Peterson is a familiar face on Madonna’s Lincoln Campus. Rain or shine (or even snow! ), Kris can be seen each week accompanying Madonna residents to doctor’s appointments and assisting with the residents’ recreational activities and outings. She also is a loyal volunteer in the Madonna Foundation office. While traveling on one of Madonna’s wheelchair accessible vans over the years, Kris noticed that staff members would continually struggle with the old, high mileage van. The amount of wheelchair positions in the van also limited the number of residents who could participate in shopping outings or go to the zoo or go on holiday light tours. “Kris came to me with the idea to donate the new van,” said Suzanne Sughroue, Madonna Foundation director of development. “I was completely overwhelmed by her generosity to help our St. Jane de Chantal program,” she added. Through the support of Kris and her husband, Don, the wheels were put in motion. A new wheelchair-accessible van was ordered and took its maiden voyage with a resident shopping trip to Walmart. “We are so grateful to Kris for her generous gifts of treasure, time and talent,” Suzanne shared. Volunteering at Madonna runs in Kris’ family. Her mom, Mary Zender, was a long-time welcome desk volunteer. Additionally, Kris is very familiar with the patients and staff at Madonna as her father, Bob Zender, spent time in Madonna’s long term care unit before his death in 2013.